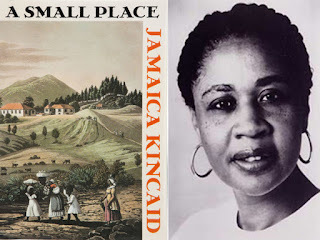 Jamaica Kincaid's short story, "Girl" (1978) is remarkable in the way that it captures a personal voice expressed through what appears at first glance to be either the voice of an admonishing mother, or a stream of consciousness or an internal dialogue. The voice is powerful and it conveys the identity of the narrator by means of a series of guidelines, reminders, and "notes to self" that show the social construction of identity, as well as the way that one defines oneself by means of daily tasks. Because the story does not tell the reader who the narrator is, the reader may make assumptions. In order to analyze the story, it is often a good idea to create a list of guiding questions and then systematically answer them as you refer to the text. • How does the story begin? What are the activities? What do they entail? When I delve into the story, I find myself a bit off-balance. It’s hard to tell who the narrator is, and what exactly is going on. My first impulse is to assume it’s an internal monologue – one of the voices that tends to inhabit the recesses of one’s mind, and which, when analyzed, tend to be a composite of the voices that we listened to and abided, which is to say we respected them to the point that we internalized them, for good or for worse. This voice is not a very nurturing voice, and after I read further, I see that there is a bit of “talking back” so that instead of an internal monologue, it is, at the very least, a dialogue. • Who is the narrator? The narrative is speaking in second person and she is addressing the “girl” of the title. There are at least two possibilities for the narrator: First, she could be the girl herself. Or, second, she could be the mother of the girl. • How does the narrator express her thoughts? How does her manner of expressing the thoughts in second person impact the reader? The narrator expresses her thoughts in the form of a series of commands, practical guidance, admonitions, veiled insults, and commentary on the kind of life / context she lives in. The reader can detect a rage at the limitations of her life and also the need to conform to social norms and adhere to strictures. • How does the author use concrete descriptions and vivid details? The passage is filled with specific names and unique terms which give the text a very unique flavor; they locate it squarely within the culture of the Caribbean, without actually saying which island. The use of idiolect for the names of music and also the names of herbs, foods, and activities clearly locate the narrative within a specific place / time / socio-economic context. • Where do you find repetitions? Of activities? Of descriptions? Please list the specific examples or phrases. • From the details provided, what can you surmise about the narrator? What does she do? What is the level of technology that surrounds her? Please list the specific examples or phrases. What might the context be, in terms of socio-economic or cultural issues? The narrator lives somewhere in the Caribbean and is very concerned about the proper way to conduct oneself in order to be respected within her society. It is not clear whether or not she is poor, working class, or middle class, but one senses that she is in a lower socio-economic level because of the number of tasks that have to be done, and there does not seem to be automation or assistance. The narrator is female. She may be the mother of the girl. If so, she is very strict and exacting, and her admonitions are very clear. They may be done with the goal of protecting the daughter and giving her a future. However, there are so many insulting and demeaning sentences interspersed that one cannot read the passage without feeling a sense of tension and creeping despair. If the narrator is the girl herself who has internalized the voice of the mother (or the collective consciousness of her context), it is very sad because one can see the internal landscape of repression, self-censoring, self-limitation, and above all, a profound inability to accept herself as she is. Granted, a socialization process requires some changes to be made to oneself, but socialization processes should not require absolute extermination or extinction. • What are some of the values that are expressed in the passage? How do you know? Please list the specific examples or phrases. This text is, in essence, a normative text. It deals with social norms as well as family norms, particularly as they relate to the behavior and values of a young girl or an adolescent. They are clearly sowing the seeds of rebellion, which may be healthy in its way, if it means being able to have the strength and courage to think for oneself. However, the micromanaging prescriptiveness of the admonitions (After all, why wash whites on Mondays? Why not Tuesday? What are the reasons for the edicts?) is constant (and sets up a rhythmic structure in the text, kind of an anti-benna).